Lightning McQueen’s Racing Academy has become a real winner with little ones.! Hotshot #95 dazzles like never before in this awesome new addition to Disney’s Hollywood Studios®. Families buckle up for high-octane fun that begins outside the Sunset Showcase with a lively pre-show experience featuring Lightning McQueen’s pit crew. There are games like Tire Toss, photo ops with Cruz Ramirez, an energizing dance party hosted by D.J. — and the soundtrack is genius. All of this leads to an indoor theater for the big show that’s loaded with action, trivia questions, and a 200-foot long wraparound screen sure to keep rookie racers totally engaged. And wait till you see the legendary Lightning McQueen in person and learn all his tricks on the course. Ka-Chow! Take a look at the fun these little ones had. Need help planning your next Walt Disney World Vacation? At last! The day is here! We now have some details for the much anticipated opening of Star Wars Galaxy’s Edge! On opening day for phase one, your Clients will be able to live your own Star Wars story and take the controls of the most famous ship in the galaxy aboard Millennium Falcon: Smugglers Run, sample amazing galactic food and beverages, explore an intriguing collection of merchant shops and more. And for phase two, opening later this year, will be Star Wars: Rise of the Resistance, the most ambitious, immersive and advanced attraction ever imagined that will put guests in the middle of a climactic battle between the First Order and the Resistance and will blur the lines between fantasy and reality. In light of tremendous demand, Disney made the decision to open the land in phases to allow Guests to sooner enjoy the one-of-a-kind experiences that make Star Wars: Galaxy’s Edge so spectacular. Guests planning to visit Star Wars: Galaxy’s Edge at Disneyland Park between May 31 and June 23, 2019 will need valid theme park admission and will be required to make a no-cost reservation, subject to availability, to access the land. Information on how to make a reservation will be available at a later date. Guests staying at one of the three DisneylandResort hotels during these dates will receive a designated reservation to access Star Wars: Galaxy’s Edge during their stay (one reservation per registered guest); valid theme park admission is required. A reservation will not be offered or required to experience Star Wars: Galaxy’s Edge at the Walt Disney World® Resort. And you should know that valid theme park admission to Disney’s Hollywood Studios is required to visit Star Wars: Galaxy’s Edge after its opening on August 29, 2019. Capacity is limited. Additionally, Star Wars: Galaxy’s Edge will be open during Extra Magic Hours. During Extra Magic Hours Guests staying at select Walt Disney World Resort hotels can spend extra time at Disney’s Hollywood Studios enjoying select attractions. Details will also be available at a later date. Contact your Upon a Star Agent to see this immersive land for yourself! The new “Disney Junior Dance Party!” is a musically infused, interactive concert, hosted by Finn Fiesta and a DJ – named Deejay, of course – who will involve everyone in all the fun, including live appearances from some of your favorite characters, fun music from Disney Junior and much more. Stay tuned for more info on opening dates for The Disney Junior Dance Party!! Your Upon A Star Agent can help you plan the perfect Disney Vacation! Contact them today! Don't have a Travel Expert yet? Contact us HERE today! Exciting Toy Story Land News! When Toy Story Land open June 30, 2018 you will be greeted by some very familiar friends! Woody, Buzz and Jessie will be greeting guests throughout Toy Story Land on a daily basis. Each character (along with the rest of their friends) will be joining in on the fun in a land where guests “shrink” to the size of a toy. You will be also be able to take a ride on Slinky Dog Dash, a roller coaster Andy has assembled from his Mega Coaster Play Kit, or take a spin on Alien Swirling Saucers, a galactic play set that Andy won at Pizza Planet. Woody's Lunch Box will also open on June 30th 2018! Woody's Lunch Box will be a counter service location with favorites like, old-fashioned soda float, hamburgers, hot dogs and healthy snacks! Toy Story Land guests can also walk through a new carnival game box to experience Toy Story Mania!, which has been a favorite attraction at the park since it opened. Now with a third track, the popular attraction will allows even more guests to take aim at 3D objects – using everything from baseballs to cream pies – in a variety of whimsical, fast-paced games. Who else is super excited for Toy Story Land!?!? All of us at Upon A Star can't wait till it opens! With the new discounts that just came out for this Summer, it's the perfect time to plan a trip! Contact your Upon A Star Travel expert today! Don't have an agent yet? Click HERE today to contact one of our experts! Who is excited for Toy Story Land!?! Disney World is rolling out the red carpet for the new Toy Story Land opening this summer. You will get to play big in Andy’s backyard and also get to ride big on two family-friendly attractions planned for the new land and one popular fan favorite. Here’s a first glimpse at the latest artwork for one of them – Alien Swirling Saucers. Once the aliens have powered up their flying saucers, you will get to climb into a toy rocket and hang on as aliens lead the way on an interstellar romp set to an out-of-this-world beat. And if you're really lucky, you just might get “chosen” by the claw! We can't wait to check it out in person! If you don't have a trip planned for this Summer to check out Toy Story Land, now is the time!! Let our expert agents help you plan the perfect trip! Contact an agent today here! Guests 14 and older, can enjoy an unforgettable mealtime conversation with one of the creative minds that brings Disney magic to life. Discover unique insights into Disney parks and Resorts as you enjoy lunch with a Disney Imagineer. Savor a delectable, 4-course meal in the Bamboo Room at the The Hollywood Brown Derby or Citricos at Disney's Grand Floridian Resort & Spa! Don't miss this exclusive opportunity to hear the stories behind the magic! Contact your Upon A Star Travel expert today! It's a Flurry of Fun at Disney’s Hollywood Studios! A flurry of season fun has kicked off at Disney's Hollywood Studios! Check out all of the exciting holiday happenings around the resort! Sunset Seasons Greetings – This new nighttime holiday experience features spectacular projections of Mickey, Minnie and other beloved Disney characters sharing their favorite Christmas stories as a snowy Sunset Boulevard twinkles with stunning holiday decorations. This charming scene becomes enchanted with holiday magic that brings billboards to life and transforms the famous Hollywood Tower Hotel into a giant pile of Christmas gifts, a gingerbread house and a frozen winter wonderland! A frosty summer-loving snowman might even make an appearance to share his holiday wish! The fantastic and heartwarming experience runs continuously throughout the night. Enhanced holiday décor around Echo Lake – Extra-large ornaments, colorful garlands and a giant Christmas tree centered on the water will make Echo Lake the merriest of places this holiday season. Even Dinosaur Gertie will be dressed for the occasion with a dino-Santa hat. A new friend joins the cast of ‘For the First Time in Forever: A Frozen Sing-Along Celebration’ – The holiday fun continues as Anna, Elsa and Kristoff welcome Olaf to the sing-along celebration, featuring for a limited time all-new songs from Disney’s new animated short “Olaf’s Frozen Adventure” at Hyperion Theater. Jingle Bell, Jingle BAM! – The hit holiday show returns Nov. 9, 2017 sending beloved Disney animated characters on a spirited yuletide adventure to get Santa back to the North Pole in time for Christmas Eve. “Jingle Bell, Jingle BAM!” combines state-of-the-art projections, fireworks, special effects and Christmas music to create a dazzling, one-of-a-kind holiday experience for Guests – capped by a special message from Santa himself. Jingle Bell, Jingle BAM! Dessert Party – Your Clients can wrap up their jolly holiday evening with reserved viewing of the “Jingle Bell, Jingle BAM!” holiday spectacular. This dessert party includes holiday-inspired snacks, delicious desserts, wine, beer, and specialty alcoholic and non-alcoholic beverages while mingling with a VIP Disney Character. This fun-filled holiday event is being offered Nov. 9-Dec. 30, 2017. Contact your Upon A Star agent to book! Minnie’s Holiday Dine at Hollywood and Vine – Meet Minnie, Mickey, Daisy, Donald and Goofy for lunch and dinner celebrations centered on seasonal deliciousness. From Nov. 6-Jan. 7, 2017, the mouse-with-the-mostest will deck the halls for a banquet filled with holiday cheer and the joy of the season! To make a reservation, contact your Upon A Star Agent! Santa Claus returns to the Once Upon a Time shop Nov. 9-Dec. 24, 2017. The beautiful and vintage setting reflects the bygone days of Santa’s visits to the great department stores across the country. Santa Goofy will step in for Old Saint Nick when he returns to the North Pole Dec. 25 -31, 2017. So much to do! There's still time to plan a trip to Walt Disney World for the Holidays! Contact our expert agents here today! Set to debut this November, immerse yourself in the season as Sunset Boulevard in Disney’s Hollywood Studios comes to life with some of your most favorite characters. Sunset Season’s Greetings will take place nightly from November 9 - December 31, 2017. Billboards will suddenly begin to move as they tell the stories from some of your favorite characters sharing their love of the winter season. The Hollywood Tower Hotel, fondly known by fans as The Twilight Zone Tower of Terror, will magically transform, bringing the characters’ stories to life. 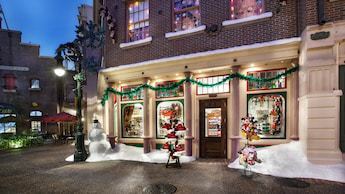 · Mickey and Minnie will reminisce about a hometown Christmas. The scene will shift to a romanticized Norman Rockwell-inspired town that starts in Black & White and then slowly changes to color. · The Toy Story characters take guesses as to which new toys will be coming this Christmas and then the scene becomes covered in holiday wrapping paper. · The Swedish Chef from The Muppets babbling on in true Swedish Chef fashion as the scene turns into giant gingerbread houses. · And lastly, Olaf will be yearning over his holiday wish with iconic music playing and the scene freezing over into a Frozen winter wonderland. The scene will be completed with dancing Aurora Borealis lights and projected falling snow. Guests can be enchanted by this new unforgettable, seasonal experience with valid theme park ticket. Contact your Upon A Star Travel expert today to book a trip to Walt Disney World to see it in person! ©Upon A Star Concierge. All rights reserved.